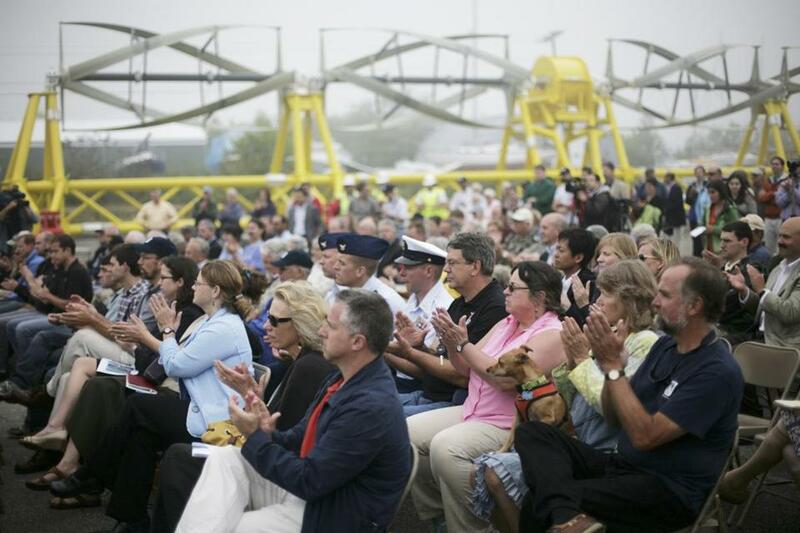 About 200 people attended the dedication ceremony of Ocean Renewable Power’s tidal generator Tuesday. EASTPORT, Maine — The nation’s first commercial tidal energy project was dedicated Tuesday in this northeastern-most city of the United States, the beginning of a new industry that energy officials project could someday generate a significant portion of the nation’s electricity. This project, developed by Ocean Renewable Power Co. of Portland, Maine, is a small first step toward this future. The tidal generator that will soon be lowered to the seafloor near here will become part of a network of 20 underwater turbines in this area, producing enough electricity to power some 1,200 homes. “Tidal energy has arrived in America and it just landed right here,” Ocean Renewable Power’s chief executive, Chris Sauer, told a crowd of about 200 people at the dedication ceremony. Maine is second only to Alaska in the number of places with strong enough tides and waves to support ocean power installations, energy officials said. The first tidal generator is expected to begin delivering electricity to the regional power grid in September, starting small, with just enough to power 25 homes. It is the product of several years and millions of dollars in investment by Ocean Renewable Power’s backers and the Department of Energy. The Cobscook Bay Tidal Energy Project cost about $21 million, including research and development, design and fabrication of three turbine units, installation, and environmental monitoring. The systems capture the energy of the moving water, rotating a turbine that powers a generator. Ocean Renewable Power came to Eastport about six years ago after realizing that Maine’s tides presented a much better opportunity than the currents in Florida, where the company was founded. Eastport is located on Cobscook Bay, which has dramatic and powerful tides that rise and fall some 20 feet over a 12-hour cycle. When tides are at their strongest, the water can move as fast as 6 knots, or about 7 miles an hour. This is not the first time someone has tried to harness the tides here to make energy. Small tide mills that use underwater wheels to power machinery have been used in Maine since at least the 18th century. In the 1930s, President Franklin Delano Roosevelt championed a plan that would have dammed both Cobscook and nearby Passamaquoddy Bay, corralling the seawater for electricity generation. Though work was started on the project, it was ultimately abandoned because of political opposition. Under a 20-year contract hashed out earlier this year, electricity from Ocean Renewable Power’s tidal generators will be sold to three Maine utilities for a starting price of 21.5 cents a kilowatt hour, or nearly double Maine’s average electricity price of 11.21 cents per kilowatt hour. The high price, local and federal officials say, is justified by the economic benefit that the growing tidal energy industry could bring to communities like Eastport, where the canneries and other seafood processing industries have all but vanished. The unemployment rate in Eastport, a city of about 1,450, topped 12 percent in June, seasonally unadjusted, compared to 7.5 percent in all of Maine and 8.2 percent nationally. Since 2007, Ocean Renewable Power has created and retained more than 100 jobs in Maine, and invested about $14 million statewide — including about $4 million in and around Eastport and nearby Lubec, where transmission lines will bring the power onshore. While ocean energy is still very much a budding industry, Paul Jacobson, a project manager at the Electric Power Research Institute, a California nonprofit, said tidal energy already is proving to have advantages over other renewable sources, such as wind. First, he said, the systems can be placed underwater and out of sight, unlike the turbine towers of the controversial Cape Wind project. Second, since water is so much denser than air, smaller devices can be used to generate power. The Energy Department estimates wave and tidal currents on the nation’s coasts have the potential to generate up to roughly one-third of the nation’s total annual electricity consumption. It is unclear how much of that potential will be realized, but much of the tidal industry’s focus is in Maine. Massachusetts and New Hampshire are also ranked among the top 10 states for ocean power potential by the Energy Department.